I'm here today sharing a card I made for the Tim Holtz 'Facebook Live' event on Friday. If you missed the event, you can still go to Tim's Facebook page to see re-play. Tim talks about all the new Stampers Anonymous Halloween stamps, stencils and inspiration cards. That's where this post comes in. I created this invitation for the live event and I thought I'd would share how I did it. 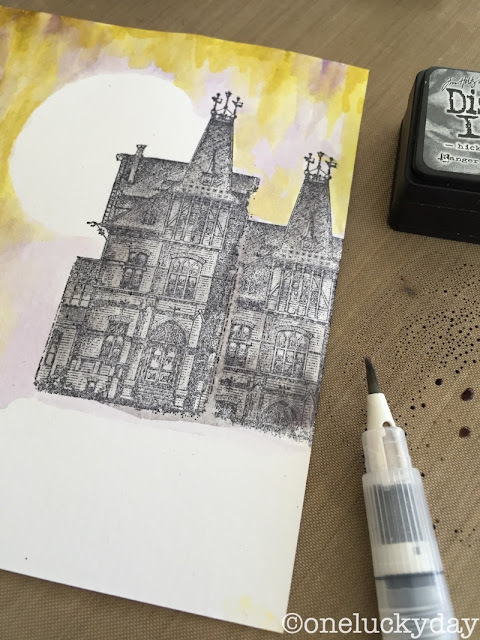 I started with a piece of Distress Watercolor paper. 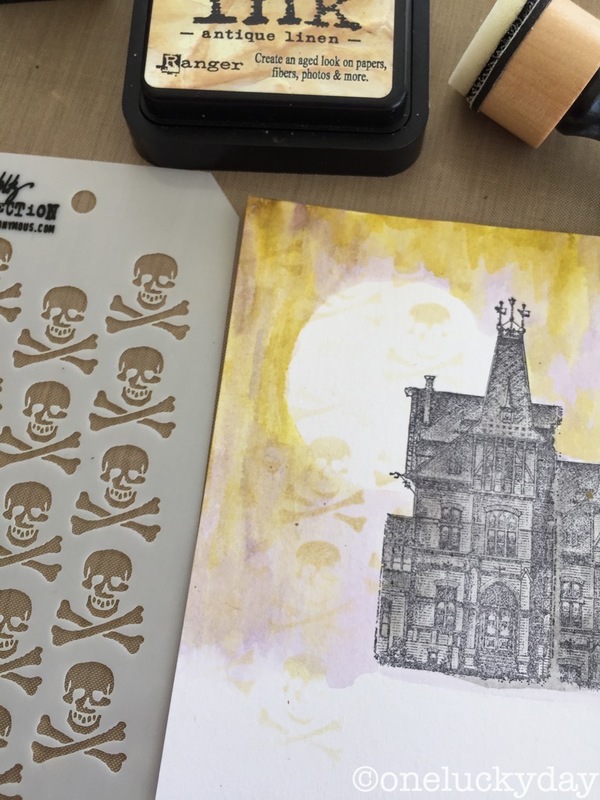 I'm using the Haunted House image from the Mini Halloween set, stamped in Jet Black Archival ink so it will not run when I watercolor the image. 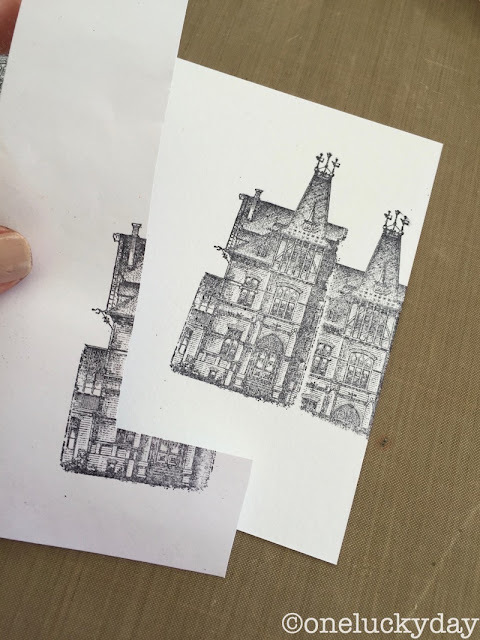 I wanted to make the house larger so I cut a mask using scrap paper to cover the first image while I stamped the second. 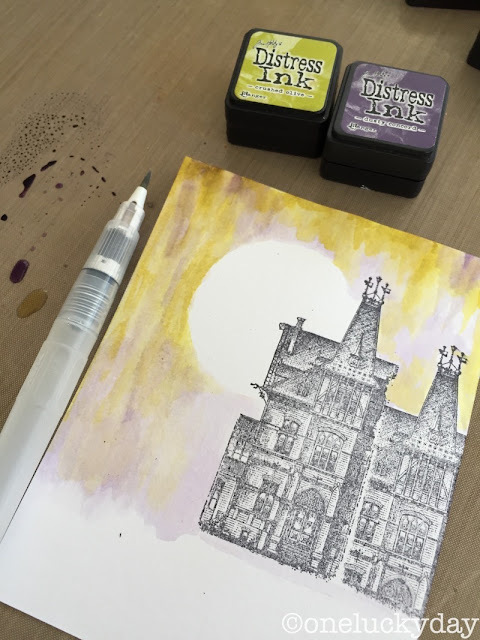 I chose a couple Distress Ink Colors, Crushed Olive and Dusty Concord and made a palette on my craft mat. Using my Detailer Water brush I painted in a background. I did use a round mask (not shown) that I cut from a post it note (so it would remain in place) while I colored around it. 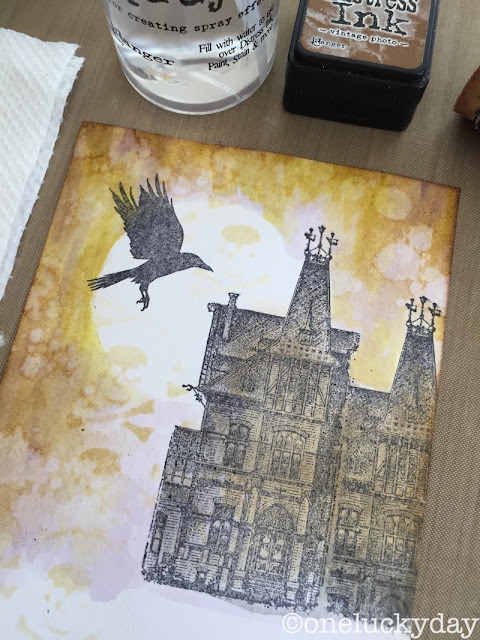 The first watercolor layer was more of a lavender wash using lots of water. The second and third were more haphazard, just painting a night sky. I really liked the Crossbones stencil (love the detail of the teeth!) and wanted to see them in the shadowy background. Antique Linen Distress Ink through the stencil worked perfectly for this tiny detail. 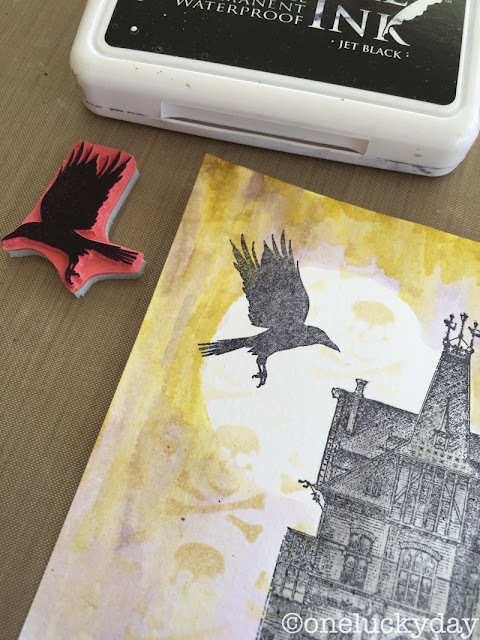 The crow stamp from the Mini Halloween set is perfect flying in front of the moon! Now here is where the background comes together. I inked the edges of the card with Vintage Photo Distress Ink. Then pulled the trigger on the Distress Sprayer, ever so slowly, to dribble water over the card front. 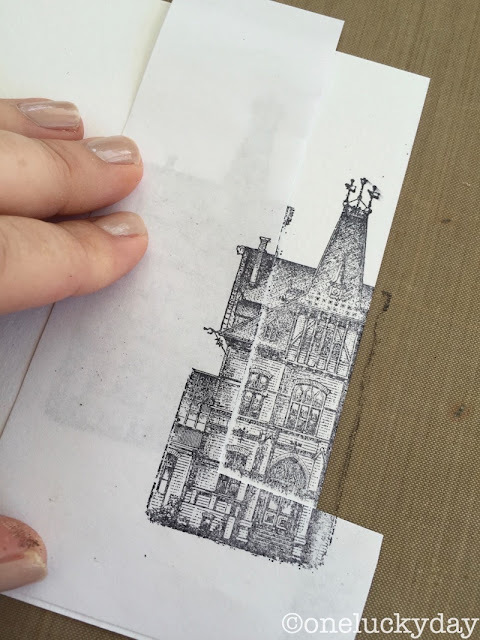 Give the water about 10 or 15 seconds to sit on the ink then pat with a paper towel to soak up the excess water, removing ink the process. Leaving you with a great night sky! You could leave the moon as it is with the cool Crushed Olive halo or add Hickory Smoke with the water brush for definition. I like it both ways! While the card is drying, I used the new Gothic Gate Thinlit to cut a piece of black cardstock. 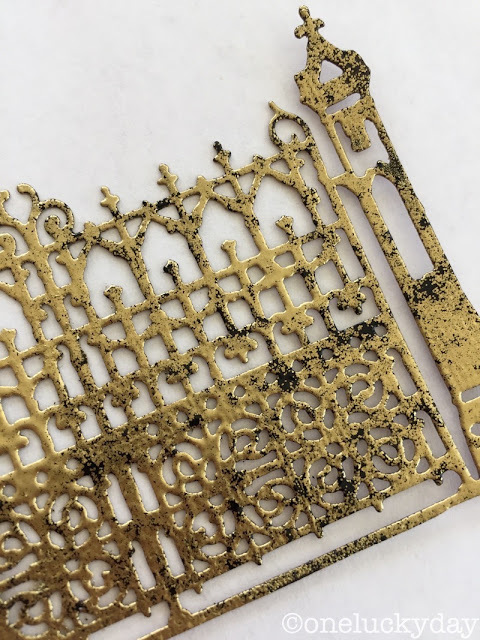 I will say this die cuts wonderfully even though it is so intricate! 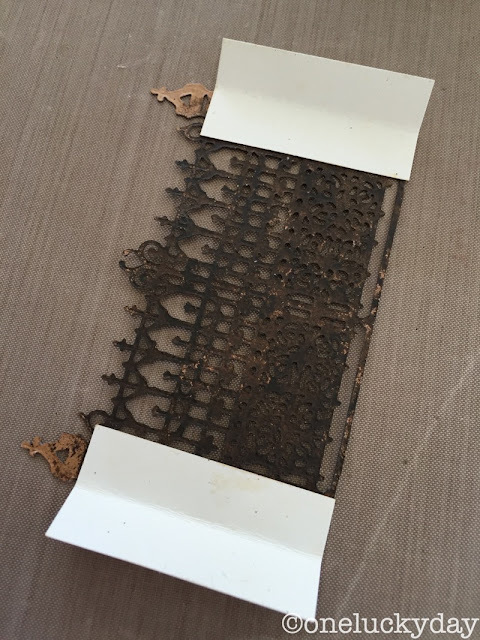 I did need to use the Sizzix Die Brush to clean the die from all those tiny pieces. 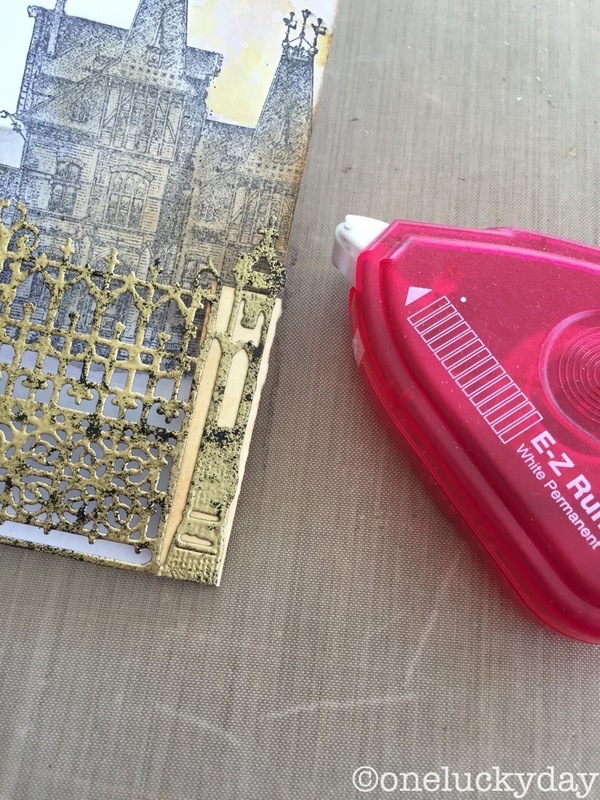 It also works like a dream on the two Doily dies that were released in the spring. If you don't have one, I highly recommend it...for $9.99 it will save you a heap of frustration and time when cleaning the intricate Thinlits. Wish I had bought one sooner. 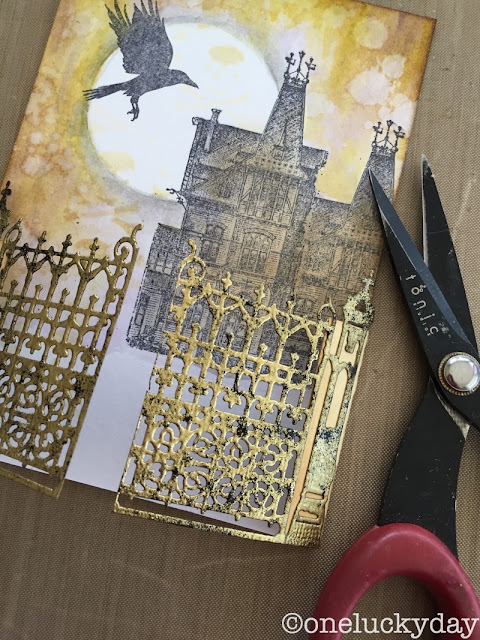 I used Watermark Embossing ink to "ink" the Gothic Gate (it's the "glue" that allows the embossing powder to stick to the cardstock). 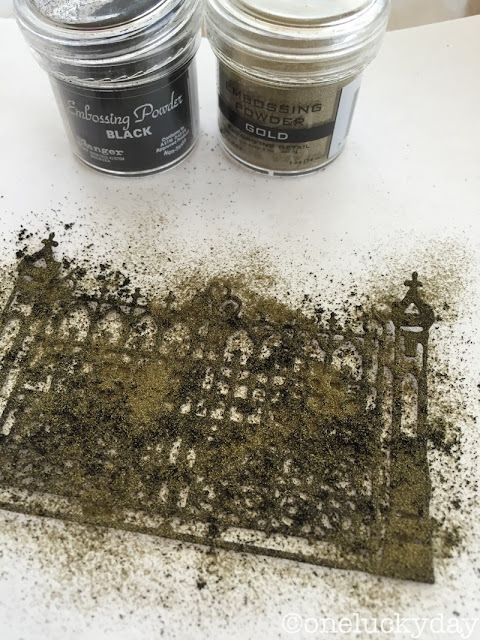 Normally in embossing you just pour the powder over the image/die cut, but I wanted to mix the two colors so the gate looked worn away in places. To do this, I took a pinch of one and then a pinch of the other until the gate was covered. It was just that easy. 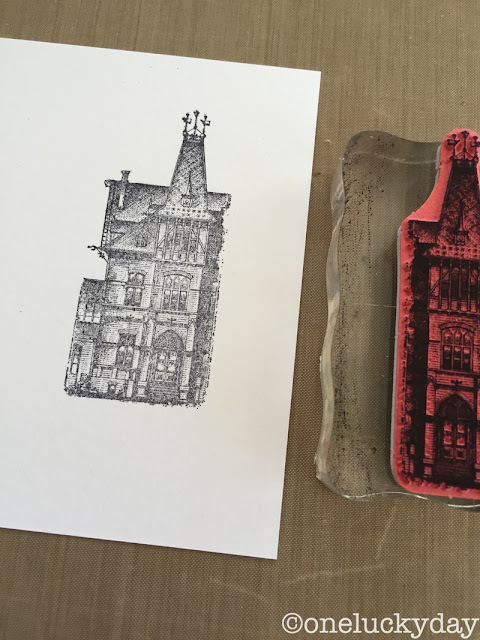 Tap off the excess (throw it away) and then emboss. I used my FAVORITE embossing gun to quickly emboss the gate. 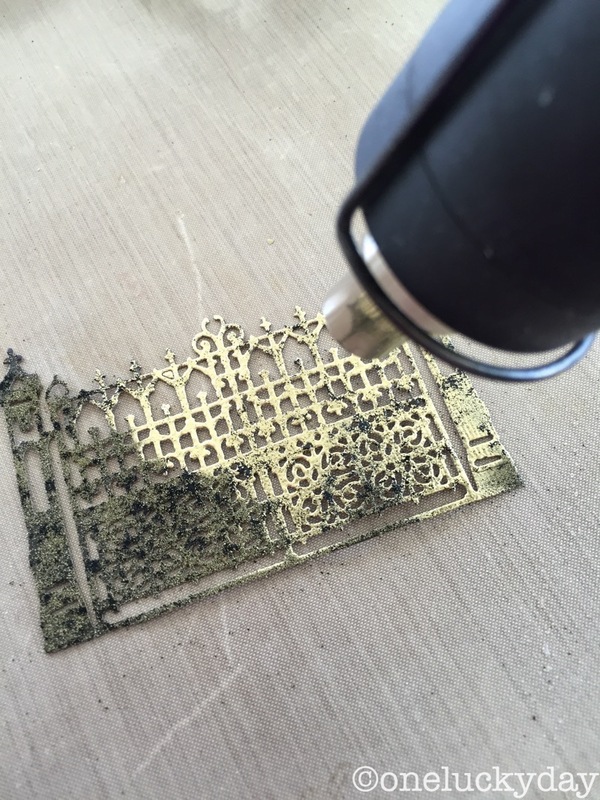 Using the Wagner, it took less than a minute to emboss the entire gate. Well worth the investment for such quick results. 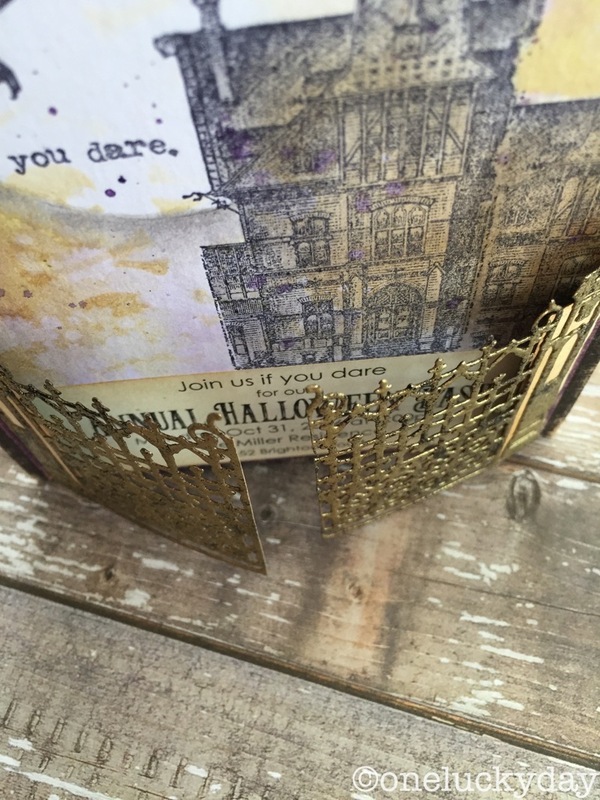 Love how this turned out with the mix of gold and black embossing powder! I cut two small pieces of mixed media cardstock to create hinges for the gate. (I wasn't smart enough to use cardstock for the gate that was black on both sides so I had to pounce Distress Paint over the back). 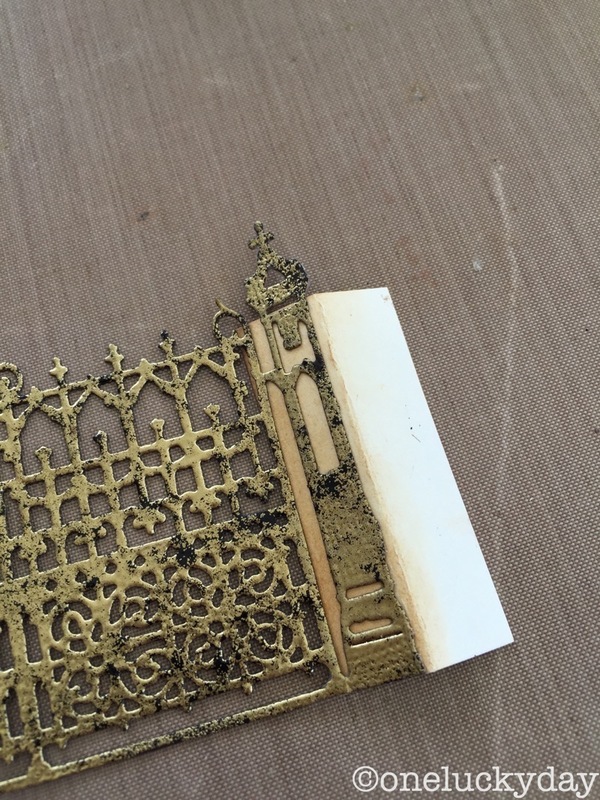 Distress Collage medium worked well to adhere the gate to the hinge. I used a tape runner on the back of the hinge to add it to the card (the hinge will be sandwiched between the card front and a purple backer card that I will add later). Cut the gate up the center. Mount the card on a purple backer. Add Mini Fasteners in the corners. Mount the card on a black backer which will hide the brad legs poking through the purple. 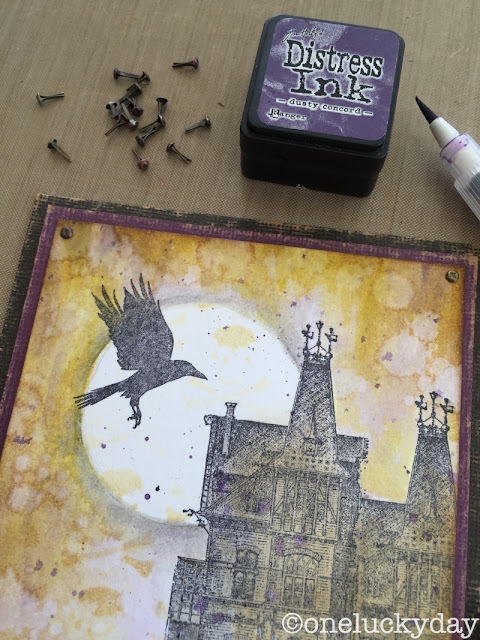 Make a palette on Dusty Concord on the craft mat. Add a water to make a puddle. 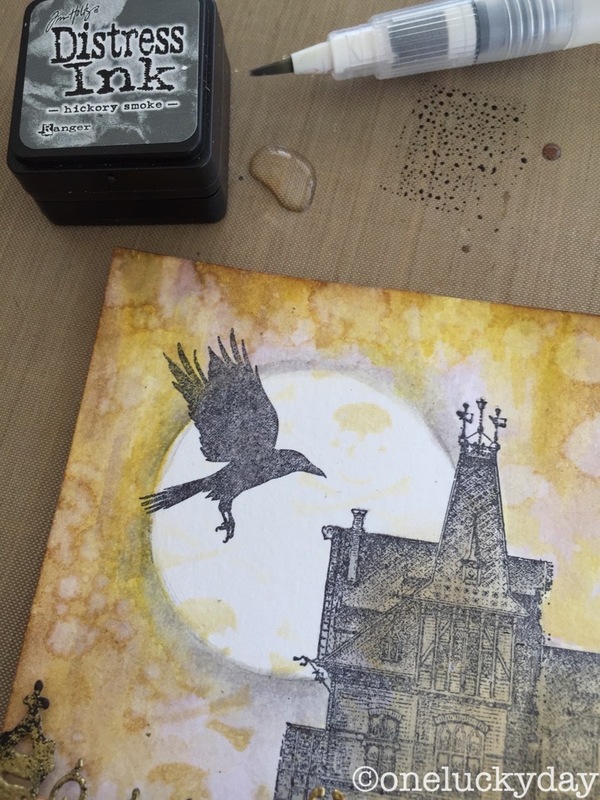 Using the water brush, pick up the ink/water mixture. Tap the end of the water brush so it sprays across the card. Dab up any excess with a towel. I created an invitation on my computer to fit in the open space. One last stamp from the set, just perfect for the invitation! 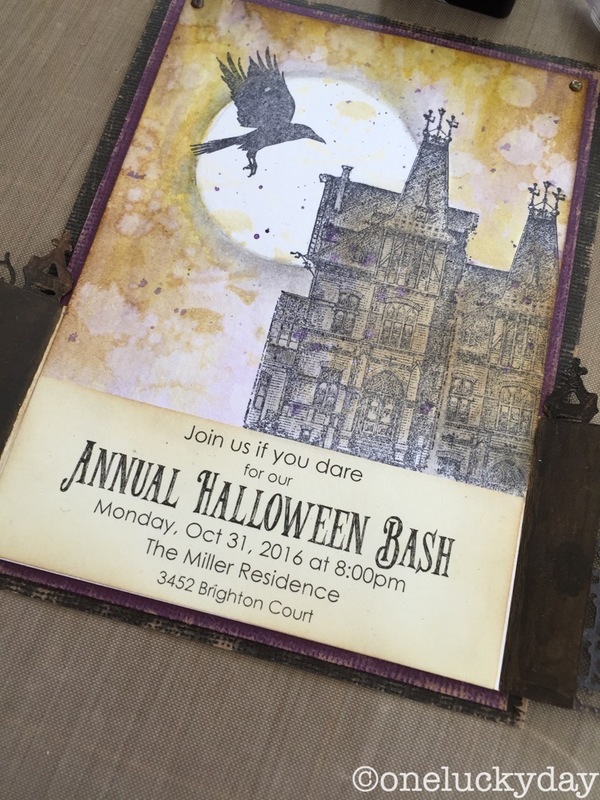 And there you go, a perfect little invitation for a Halloween party! Once you make one, it would be easy to make more if you did it assembly line style. 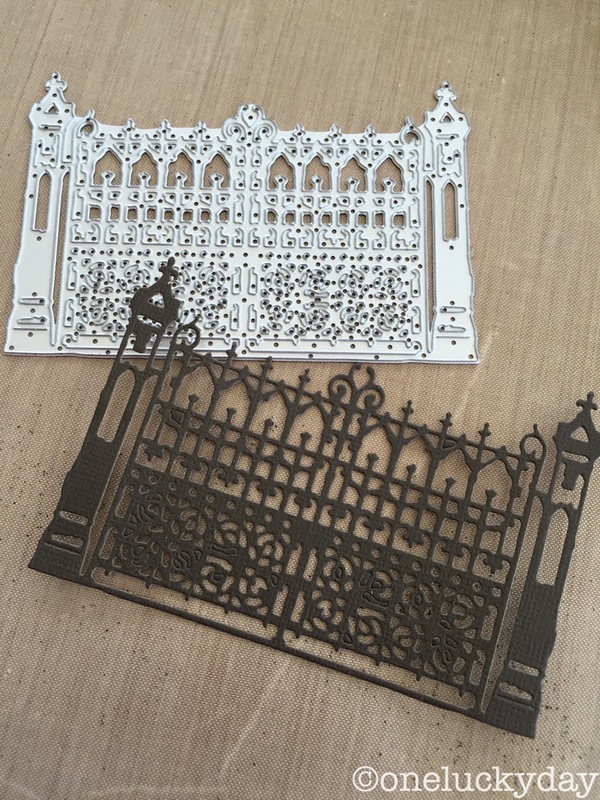 I would be all over embossing more Gothic Gates since I love that part with the Heat Gun! I hope you liked today's tutorial. It's a fun invitation but would also make a super Halloween card too! Paula, you really outdid yourself! It is amazing!! Thank you, Paula! I just love how your card turned out! I can't wait until my order arrives so I can start playing! thanks Tracy! I like that look too. I think you could make a huge mansion! my favourite card from the video - I need that gate! It's such a gorgeous card, Paula, i love it! Love your design and all the added touches! Fantastic Paula! I just love this card! I cant wait to get my gate die!! glad you are getting the die - seriously, it cuts like a dream! Spooktacular Paula! Clever idea to expand the mansion. Crushing on that gate finish. Thanks for sharing. thanks Vicki - appreciate the good words today! Can't wait to see what you do with the stamps! Awesome card! Love your idea for the gate. TFS Paula! You've used my three most favorites from this year's Halloween release: That bird, that house, that gate!!! You pulled them together perfectly and have made me want them even more. Hah! This is fab! Love the house 'expansion' and especially the amazing gate. Gorgeousness. I can see that gate patina'd with blues and greens! I LOVE this card!You always have the most clever ideas! I love this card - a masterpiece. 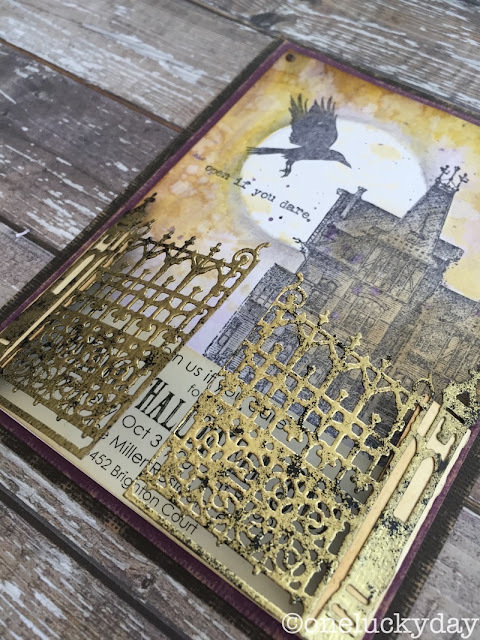 Thank you for showing us the masking to make a big house as it is a wonderful detail for the card. And the embossing is a great idea as well. I can't wait to get the gothic gate die. You are a Goddess of Gothic wonderfulness. Brilliant, Brilliant addition to the haunted home; and the gate... jaw dropping amazing! Super creative. Absolutely gloish. It is amazing. Love your card Paula! The gate hiding the invitation is SO cool and I'm so glad you extended the haunted mansion, (because I want to live there)! What a great, great card! I saw it on FB along with the others and you guys all killed it! Every card was fantastic! Love the gate thinlit! oh my soul!! i loved all your projects Tim showed us on Live......i must get me one of those mats for my gate die! This is so cool Paula! I love the gate and the multicolor embossing. Just fabulous. Absolutely stunning! Thank you for going through your steps to make it. Inspiring! this card is seriously scary looking! all eerie and gothic! I love it!! Such a wonderful creation! And thanks for sharing the steps! I love the part about the gate. Will keep in mind when I want to do any rustic kind of look. This is so fabulous! I LOVE LOVE LOVE the gate...too clever! Love your invitation! Fantastic tutorial! 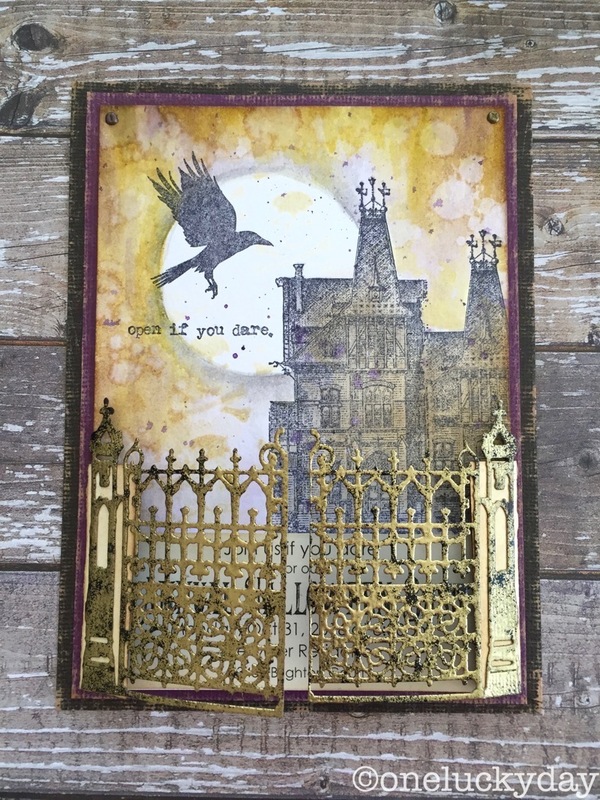 Gothic Gate Thinlit is now on my shopping list. I happened upon your blog while perusing Pinterest.....lucky me! 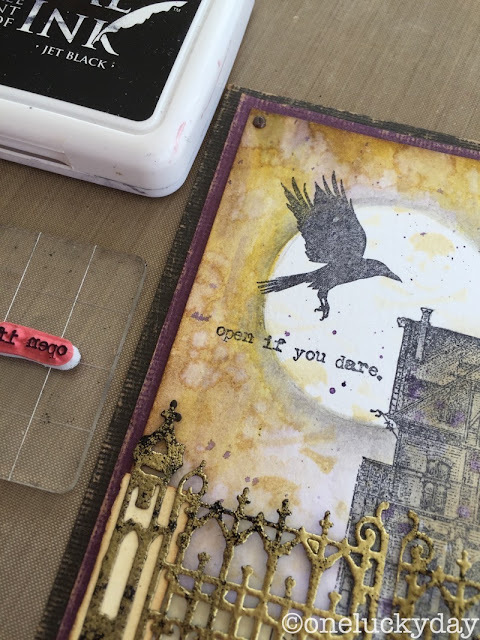 Your projects are gorgeous and I love how you show step-by-step instructions making complex cards appear relatively easy!! Thanks. Did you know you can create short urls with AdFly and receive cash from every visit to your short links.